When I stepped onto the wooden viewing platform on Cerro Chaman, I could see the deep, wide valley right below me, covered with countless vineyards. The valley, surrounded by long ranges of dry hills and heated by the March sun, meandered off into the distance. 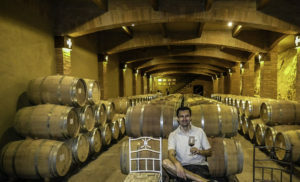 No wonder this part of the Colchagua Valley supplies the photographs that are used for promoting Chile as a wine destination, but I discovered it is not only for wine-sipping. As I was enjoying the view, I did not yet know it would be the only time for a quiet meditation in Colchagua Valley. I had originally envisaged that my day-and-a-half stay here would be a completely meditative break, filled with leisurely wine-tasting, after my rather intense travels in central Chile. Unfortunately for me, Colchagua is not just wine country—it turned out be a window into the country’s culture and history that I just couldn’t resist. Cerro Chaman, the hill with the view, belongs to the wine estate of Viña Santa Cruz, where I made my first stop in Colchagua. At the estate’s reception desk, I was greeted by my guide, Diego, who led me to the estate’s cable car that would transport me to the top of the hill. Decorated with the Viña Santa Cruz’s coat of arms—which, of course, contains a cross (cruz)—the red cable car has become an icon of Colchagua. Surprisingly and fortunately, I happened to be the lone visitor of the stunning estate that particular morning. I was the lone visitor touring the estate. After I returned from the hill, Diego showed me around the winery’s cellars. Even though the building and the equipment were perfectly well-kept, the winery exudes the feel of an old-time, well-established estate. I could not believe my ears when Diego told me that the winery was built in 2003. Yes, a mere sixteen years ago, this part of the valley was just fields and meadows with no vineyards at all. Viña Santa Cruz was the brainchild of Carlos Cardoen, a Chilean tycoon who made his name in an arms manufacturing business. 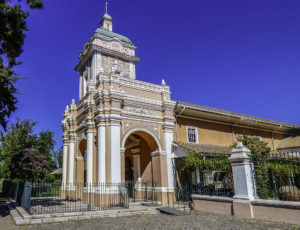 After getting involved in an arms deal that went sour and led to legal disputes with the U.S. government in the early 1990s, he turned his attention to a completely different type of investment: developing his native Colchagua Valley; its wine, culture, hospitality, and tourism industries. 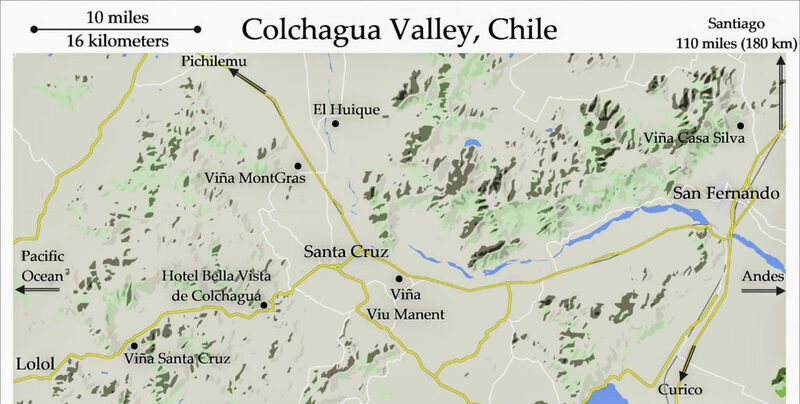 If one person should get credit for putting Colchagua on the international travelers’ map, it is Mr. Cardoen. The animal symbol of Chile on Cerro Chaman. 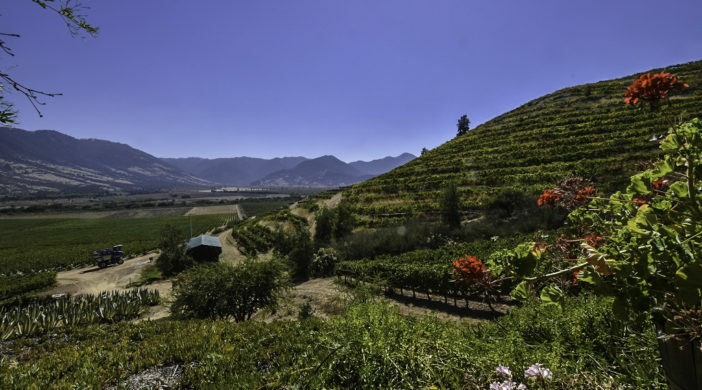 The recent success of Colchagua and Viña Santa Cruz follows the broader story of Chilean wine, neatly chronicled by the journalist Peter Richards in his book The Wines of Chile. He writes that while grapes arrived in the country with the Spanish Catholic Church, which needed wine for liturgical purposes, the first real boom in Chilean wine-growing took place in the 19th century. Back then, local winemakers began to import more European grape varieties and expand production. Europeans also started to take notice of Chile, thanks to its favorable climate. Soon, things really shifted into high gear when the phylloxera insect destroyed large swathes of vineyards in Europe — in France, especially in the late 1860s – leaving the old-continent winemakers in search of new territories, one of which was Chile. The growth of the Chilean wine industry came to an abrupt halt in the mid-20th century, due to government policies designed to reduce alcoholism and break up the large wine estates. After the turmoil of the 1970s, the next three decades brought renewed growth of the Chilean economy and a smooth transition to democracy—the perfect conditions for the second Chilean wine-making boom, which has been under way ever since. 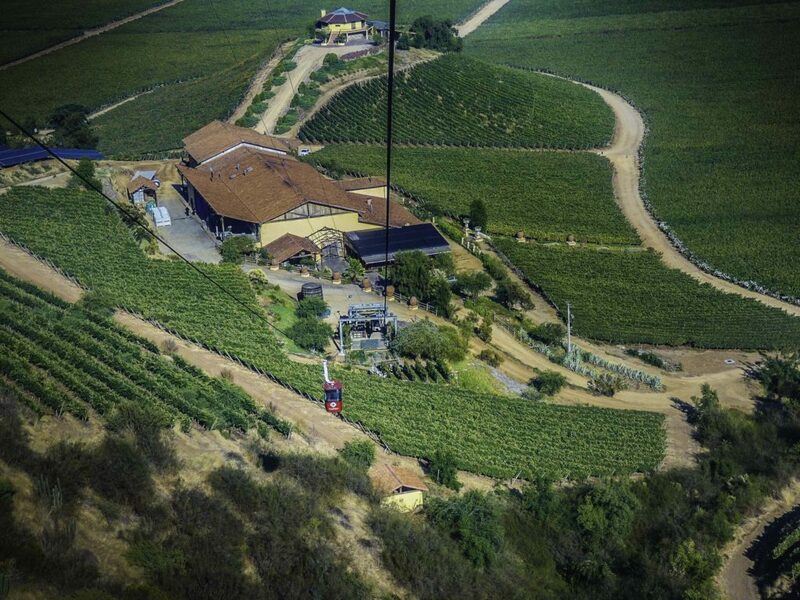 Facilitated by an exploding number of new wineries, like Viña Santa Cruz, the annual production of Chilean wine has risen from 2.8 million hectoliters (74 million gallons) in 1991 to 12.9 million in 2016 (341 million gallons). Quality also has improved, exports have skyrocketed, and Chilean wine has expanded beyond Latin America to reach connoisseurs, as well as everyday consumers, in North America and Europe. Viña Santa Cruz—a product of the second boom in Chile’s wine-making. Back in the Viña Santa Cruz’s cellars, Diego presented several wines for me to taste. 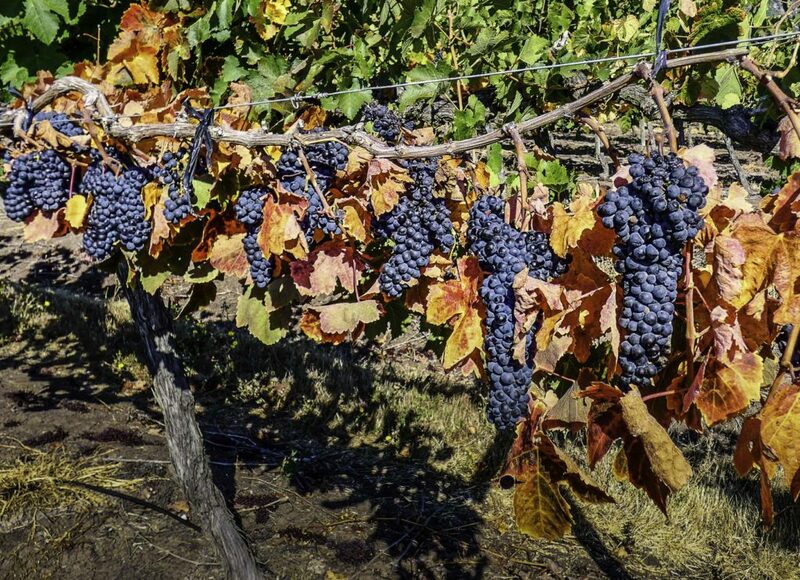 Despite Colchagua’s diverse climate, the region tends to be warm and dry—ideal to grow red varieties. I was thus served a Cabernet Sauvignon and a Malbec, along with Diego’s half-joking comment about the superiority of Chilean Malbec over the Argentinian one. The historical rivalry between these two countries spilled over into their wines, too! The tasting also included one variety that many red wine aficionados come to Chile specifically for: Carménère, with its deep notes of peppers, spices, and dark fruit. As Diego explained, the Carménère grape needs exceptional care—for instance, it gets harvested last, oftentimes in May (November in the northern hemisphere’s wine calendar). Exhibit about the Rapa Nui (Easter Island) culture, one of the inspirations for the Viña Santa Cruz’ wine. Originally from France, Carménère arrived in Chile during the country’s initial wine-making boom in the first half of the 19th century. Its name comes from carminé, the French word for crimson, referring to the autumn color of the grape leaves. Soon, however, winemakers in Chile began to process Carménère together with Merlot. Meanwhile, the 1860s phylloxera epidemic basically wiped Carménère off the European wine map. As a result, the variety was almost forgotten. Until the 1990s, that is, when a DNA test of suspicious-tasting Chilean Merlots revealed that they were actually Carménères that had inadvertently survived in European plague. In Carménère, Chile has a unique grape that is not found anywhere else—one that symbolizes the country’s ascent among the world’s wine-making superpowers. 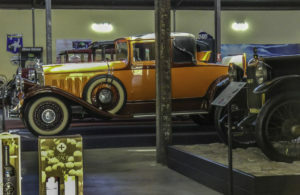 Museo del Automóvil at Viña Santa Cruz. My preference for white wines did not allow me to fully appreciate Viña Santa Cruz’s unique flavorful red vintages as much as others might, but it didn’t diminish the estate’s appeal to me. Beyond the wine selection and the picture-perfect grounds—complete with floral decorations—I was also able to enjoy their two museums. On top of Cerro Chaman, besides an enclosure with lamas and an astronomical observatory, I checked out dwellings and artifacts of three Chilean native cultures: Mapuche (coming from the south of Chile), Aymara (north of Chile & Bolivia) and Rapa Nui (Easter Island). In fact, these three cultures provide the inspiration (the “soul,” in the winery’s words) for the wines produced on the land (the “body”). One of the lines of their wines is therefore called Chaman (“tribal healer”). The second interesting museum at the estate is the Museo del Automóvil, which displays more than fifty old (restored and polished!) vehicles. After this touring and tasting, an avocado sandwich lunch at the estate’s restaurant was the appropriate Chilean conclusion to the morning. After all, besides wine and copper, Chile is becoming an avocado superpower, too. 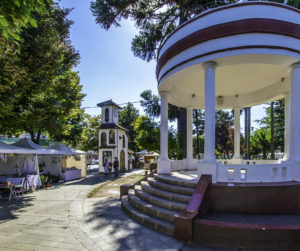 According to my original plans, I was supposed to pay just a brief visit to Santa Cruz, the town at the heart of Colchagua Valley, before devoting myself to wine-sipping leisure. I enjoyed the town’s lively plaza, which had all the usual Latin American amenities: trees providing shade; a musical kiosk; a clock tower that houses a tourist bureau; a low-rise, columned colonial town hall; a hotel (Hotel Santa Cruz); several restaurants; and, of course, a white façade church. However, a few steps beyond the plaza, I found myself at a structure that would ruin my plans for the rest of the day: Museo Colchagua. Expecting a small, low-profile local museum, I entered its exhibition rooms. “It is mainly a paleontology museum,” I thought to myself, as I was browsing trilobites and dinosaur skeletons. The next rooms, however, told the story of Chilean pre-Columbian cultures. So, perhaps an archeological museum, too? Then came Spanish colonization and the era of independence (History museum? ), Catholic Church and Chilean cowboys called huasos (Ethnographic museum? ), Chilean newspapers and radio (Media museum? ), life-size carriages and trains (Transportation museum? ), and weapons (Police and military museum? ), which were then followed by agricultural equipment. After I saw the last harvester machine, I realized that I had spent hours getting the most comprehensive and engaging tour of Chile imaginable. Yet all of those exhibitions paled in comparison to what came next. 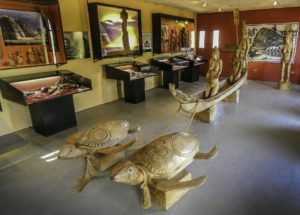 The museum’s final rooms resembled a mine, designed to draw visitors into the world of the thirty-three miners who, on August 5, 2010, went to work, as usual, in a mine in northern Chile. That day, however, a rockslide caused a collapse of the mine and trapped them 2,260 feet (690m) below ground. You may remember the story because it kept the whole world in suspense for many, many weeks. When an initial probe confirmed that the miners were still alive, a major rescue operation got underway. The engineers assumed that it would take several months to drill a hole from the surface to the shelter below, where the thirty-three (Los 33) were trapped. In the end, it was completed sooner than originally thought, and the rescue team began to lower a capsule through the hole to reach the miners. After sixty-nine days underground, their exhausting wait was over. In front of a global television and internet audience of a billion people, the miners were lifted, one by one, back to the surface in the capsule, to be greeted by their loved ones, as well as by the country’s president. All thirty-three survived. Museo Colchagua: Fénix 2, one of the capsules that was used to rescue the miners in 2010. 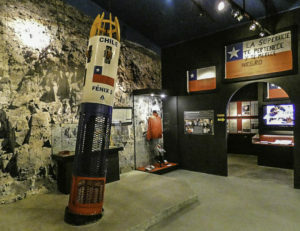 The museum’s Grand Rescue (El Gran Rescate) section tells the story of the accident and of the rescue operation in goose-bump-inducing detail, accompanied by memorabilia of the miners and the rescuers. At the very end of the exhibit, the most spectacular artifact appeared: Fénix 2, the actual capsule that was used to bring the miners to the surface. (In fact, it is one of three capsules used for the rescue—I was able to see another at the Maritime Museum in Valparaíso). The emotionally overpowering exhibition reminded me that back then, the spotlight turned not only on the rescue effort but on Chile as well. If the mettle of a country can be measured by the speed and efficiency it employs to rescue its citizens (as opposed to suppressing news about incidents), then Chile passed that historical test with an A plus. Live, in front the whole world, it was a symbolic, coming-of-age moment, reinforced by another event that year: the country was admitted to the OECD—a club of advanced economies—resulting from Chile’s two decades of growth and democracy. One question remained, however: How did such a superb museum end up in a fairly remote, smallish town? The answer is the same as that for Viña Santa Cruz: the businessman Carlos Cardoen. The museum was created in 1995 and has been run since then by Cardoen’s foundation. He actually developed even more landmarks found in the town, including the hotel in the plaza. Red and white landscapes: Realizing that my time in the Colchagua Valley was ticking away, I rushed to visit—at least briefly—other wineries in the vicinity of Santa Cruz. The oldest of them, Viña Casa Silva, was founded in 1892, but, under the leadership of the fifth generation of the Silva family, it only began to commercialize its wine in the 1990s. Its scenic grounds, with the backdrop of steep slopes to the surrounding hills, can relax visitors as much as the wine does. The same holds true for Viña Viu Manent, another established winery, which is able to boast beautiful views of the towering white, snow-capped peaks of the distant Andes, standing high on the horizon above the vineyards. Bike trip across Viña MontGras: Merlot was looking ready to be harvested. After the tastings and the museum tours, I felt the need to squeeze in a little sports activity. I rented a bike at Viña MontGras, where they allowed me to roam their vineyards on my own, but only on condition that I not disturb the workers and trucks which were in the full swing of the harvest. I rode several miles, crisscrossing the large estate, observing that some of the wine leaves had already changed into their autumn colors. Among them, I noticed some vivid red ones, which, by then, I knew was the hallmark of Carménère. The boldly orange ones then belonged to Merlot. Upon returning the bike, I had a glass of Syrah at the winery and then headed for my last stop in Colchagua. No more time for history: While the wineries provided a window into today’s success of the country, Hacienda El Huique, close to Santa Cruz, was a throwback to what the area looked like in the distant past. This estate had its roots in the 17th century, despite the current hacienda structure being mostly built in the 19th century. Back then, agriculture in Latin America was organized around large haciendas which employed thousands of workers and were run by aristocratic families. The Hacienda El Huique compound still shows traces of the colonial architectural style, not the least in its 75 foot (23 m), pink bell tower protecting the entrance to the hacienda’s chapel. 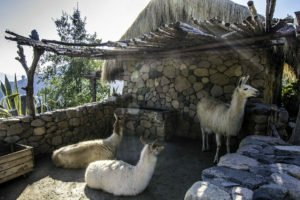 The estate has become a museum, El Museo San José del Carmen de El Huique, that gives visitors a sense of what daily life was like for its owners and workers in the 17th and 18th century in Chile. Unfortunately, I didn’t have time for a tour of the museum as I was about to drive back to Santiago for the next part of my trip. Leaving the valley I had mixed feelings. Seeing how old traditions and recent hard work are shaping the country of today was an unexpected pleasure (a traveler’s dream!). I certainly was able to appreciate Chile much better than had I just stayed in Santiago. Sadly, I also regretted not having allocated more time to explore Colchagua—in the end, I was still craving that one last relaxing day sitting comfortably in the shade with a fine glass of wine. The most comprehensive resource for all things Colchagua can be found at: https://www.rutadelvino.cl/en/. The two principal towns of the area are Santa Cruz and San Fernando. During my visit, I stayed at the boutique hotel Bella Vista de Colchagua: https://bellavistadecolchagua.cl/en/home/. The hotel sits 6 miles (10 km) away from Santa Cruz. Beautiful grounds and superb service. now on my wish list for the coming year of travel. Thank you so much Lee – it was definitely enchanting experience to visit the wine country at the foothills of the mountains. I was surprised how underappreciated place it was! Great introduction to the wines of Chile and the history of the Colchagua Valley area. Thank you David, I am glad you liked it! It was definitely an unexpectedly charming place. Thank you Libor for the wonderful description of your travels. Next time I go to Peru I will definitely take some days to go to Chile. I will follow in your footsteps and do Santiago and the Colchagua Valley. Wine and history sounds like my cup of tea. But without the motorcycle ride!